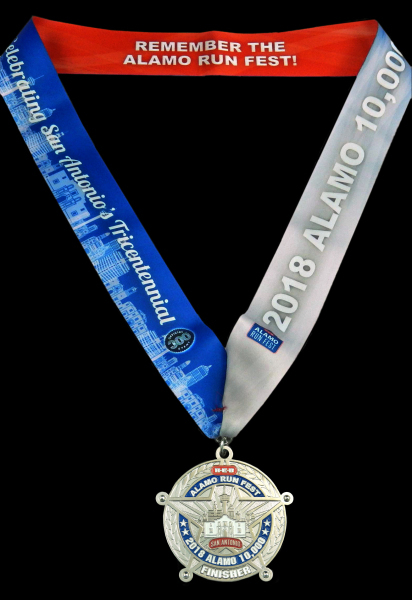 Starting in the shadow of the majestic Alamodome, the Alamo 10,000 route mirrors 6.2 miles of the Alamo Half route through beautiful downtown San Antonio, passing numerous historic landmarks before finishing back INSIDE the Alamodome. It’s a flat, fast course and provides a great opportunity to shoot for a PR! The route will be USATF Certified, as it has been in the past. event, starting approximately 50 minutes after the start of the Alamo Half. to the first 2,400 people to register. Registration will automatically shut off for the 10K once limit is reached. You must be pre registered by end of day 3/8/19 to have a shirt reserved for you to pickup at the Expo. Although our projections for late registrations are close and we do order extra, they are projections so you run the risk of having it mailed after the event if we run out. Active Duty Military and their dependents can receive a 20% discount on entry to the Alamo 10,000. Please read the qualifications for use and details to be able to utilize the discount during online registration. 2019 Maps will be available soon and are expected to be almost identical to the 2018 routes. 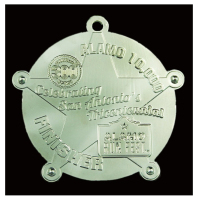 The 2018 ALAMO 10,000 Finisher Medal! This 6th Annual design commemorated SA's Tricentennial of which The Alamo Run Fest was an "Official" Event. For safety reasons and the fact that USATF insurance does not cover bicycles, skateboards, scooters, pets, roller skates, inline skates or roller blades, they will NOT be permitted on the course. Baby joggers and strollers will be allowed in the Alamo 10,000 (but NOT in the Alamo Half), however you will be asked to start at the back of the 'pack', insure your child is secured in your stroller/jogger and not run/walk with others in such a way as to impede other participants on the course. We also ask that any children seated in joggers have a helmet on and secured. Participants running with baby joggers will need to pass through a separate security screening process before entering the secured, gated starting area. The 10K course will remain open for 2 hours and 30 minutes, from when the last runner has crossed the START line during the Official Start. Any runners starting the race after the official start, will be subject to the course time restrictions based on the course closure time from the official start if (once finalized) a portion of the course overlaps with the last section of the Alamo Half, then it may remain open longer than other non-overlapping sections. The rolling closure of the non-overlapping sections of the course is based on an approximate pace of 19 minutes per mile. 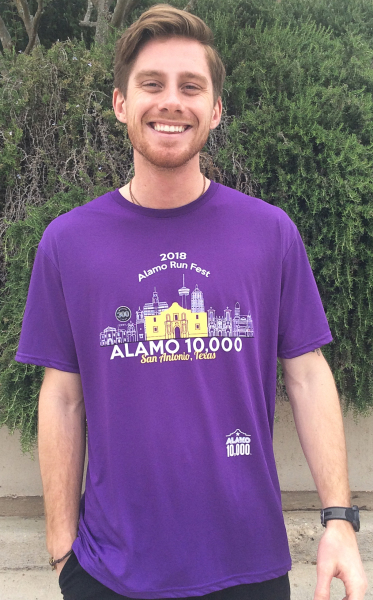 2018 Shirt - Super comfy, moisture wicking performance shirt commemorating San Antonio’s Tricentennial! to capture your race memories. Within 24 – 48 hours after the race your personal race photos will be available here.